on November 20th in Medicine Hat and across the country. Teachers across the nation were warned by school boards to be on the lookout for attacks or out-of-hand jokes towards red haired children. Throughout the day, My96FM describes that Facebook, one of the most popular social networking websites, also sported a public group declaring the event over a national scale. Continually throughout their “Free Speech Friday”, people have been calling in, discussing their thoughts on how Facebook and television is to blame. 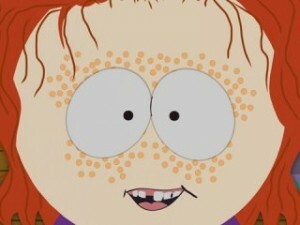 In Medicine Hat, “Kick A Ginger Day” was accompanied by few students at various schools, including Medicine Hat High School, McCoy High School, Crescent Heights High School, refusing to go to school on November 20. In other cases, one student was allegedly kicked over 200 times, while in another case, one student was allegedly hospitalized after being kicked so hard. It seems as though the situation and comments were blown out of proportion. It was reported in the Medicine Hat News (days later) that no student was kicked 200 times and no student was ever hospitalized. The police were never called about any assaults. While kids were reported to have been kicked, it was clearly only in a friendly, jokingly manner. This kind of behavior, like with most semi-violent or violent situations, brings up the irresolvable questions that asks if television and video games provoke violence. Do they? Personally, I believe that if kids are raised poorly, it will have a good effect on their judgment and consciousness, and to determine properly what is right and what is wrong. There are, indeed as we all know and have heard the media report, some cases in which youths of well-standing families turn awry and do things unexpected and violent. * Click THE JUMP below to continue reading about how television, the Internet, and video games are not responsible for violence committed by youths. Columbine High School shooting. The students that were involved in the event apparently had said “It will be just like Wolfenstein 3D and Doom!”. 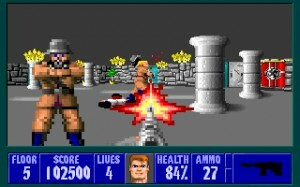 For those of you who do not know, Wolfenstein 3D and Doom were first-person shooter video games, released in 1992 and 1993 respectively, and the shootings did not happen until 1999. Both are pretty dated to be a major influence to high school students. So what takes place in these video games that makes them so violent? In Wolfenstein 3D, you are the hero William “B.J.” Blazkowicz – an American freedom fighter. You run through about 60 total missions and basically destroy all that stands in your path, whether computerized versions of Nazi’s, dogs, and even the digitalized Adolf Hitler himself. Is this a realistic situation to reenact at a High School? No. 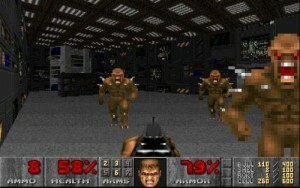 In Doom, you are a space marine destroying aliens on Mars. Aliens on Mars! Between spiked-demons that shoot rockets from their hands, giant mechanical spiders with chain guns mounted on them, and the fact that it takes place on Mars, I ask again, is this a realistic situation to reenact at a High School? No. Think of a moment… There are over six billion people in the world. For the most part, anatomically, we are all relatively the same; however, we are all different. Most of the time, the media does not take the variables of upbringing, lifestyle, the fact that we are all different, into account. Television and the Internet are primarily utilized for entertainment and educational purposes, while video games are almost always used strictly for entertainment purposes. They are not to blame for kids “turning bad”. Facebook is not to blame either. Should it not be a parents job to guide their kids in life, and not leave it to digital media to tell them what is right and what is wrong, and hope for the best? I played both these games as a kid, and I played them often and even growing up with my Father out of the country working for most of my life, I still did not turn out into a school shooter. If you need more convincing, take a look at the Jeremy Steinke Trial that is currently taking place. His Mother in interviews has explicitly expressed that he was such a well-mannered young man and would not hurt anyone, but he did, and why? Because, in his own words: “When you find your soul mate, you would do anything for them, I did anything for them.” Maybe a little out of context and extreme, but the fact remains that nice kids can turn away from a good path to bad, and not just under the influence of television or video games. There are a lot more bloody and gore-filled things out there that are more influential, depending on the medium in which they are conveyed, such as movies. The Passion of The Christ was the most brutal and gore-filled video I had ever seen, but lots of churches encouraged their congregation to see it, even encouraging the children to. What is more violent? 10-frame death animations from Wolfenstein 3D or Doom or people being beaten, whipped and crucified on the big screen, being left to hang while writhing in pain. Over a million people have seen the movie, but you do not see them going out to whip and beat people. More violent than video games? “The movie is 126 minutes long, and I would guess that at least 100 of those minutes, maybe more, are concerned specifically and graphically with the details of the torture and death of Jesus. This is the most violent film I have ever seen.” -Film Critic Roger Ebert. Quote on Wikipedia’s The Passion of The Christ. I always wonder why people get more angry over what happens in their community just because it is closer to home as opposed to the atrocities that are happening every day on the other side of the planet, and have been happening for years and years. Kind of off topic a bit, but one thing leads to another. In conclusion, I do not feel that television, Internet, or video games create the notion of violent acts in youths, but rather, it probably all stems ‘primarily’ from upbringing. So before questioning that kids are too influenced by these things, remember how it is the parents job to guide their kids. This entry was posted on Friday, November 21st, 2008 at 11:46 AM and is filed under News & Announcements. You can follow any responses to this entry through the RSS 2.0 feed. You can leave a response, or trackback from your own site.